Click here for a transcript of the show. 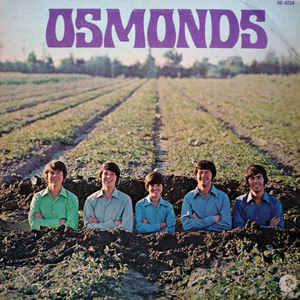 The Osmond Brothers got their real start in show business when they couldn’t get an audition for one television show, and they wound up on another. Check out the audience reaction to them at first. It cracks me up every time. This clip, incidentally, is from the show Walt Disney’s Wonderful World of Color, which most people seem to remember as The Wonderful World of Disney. Shoot, I was watching the show as a small kid (right after Mutual of Omaha’s Wild Kingdom), and remember it under the second title, which wasn’t a thing until 1969. This episode was called “Disneyland After Dark”, and the conceit behind it was that Walt Disney himself would start to introduce the different performers on the show, but he’d never see the acts himself because tourists kept interrupting him. The show, as it originally aired on NBC, was available on DVD for awhile, but appears not to be available now. 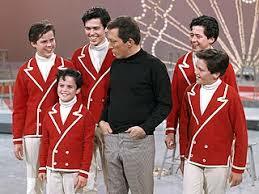 This would be later in the group’s career with Andy Williams, since Donny is part of the group now. The Disney gig led them to another show (The Andy Williams Show), and another. And finally, when they wanted to break out of their Variety TV Group image, they convinced their dad to let them record as a rock and roll band. So off they went to Alabama, as you do, and they put together an album that clearly had a Motown/R&B influence on it. It wasn’t their first album; in fact it was their SEVENTH. But it’s the one that broke big for them. The addition of Donny Osmond to the act, and the use of him in exactly the way Motown was using Michael Jackson at the same time, allowed the Osmonds to release their first hit single, and their first Number One record. What’s the secret to the song’s success? There’s a theory, and it involves fast food. As usual, here’s the show for those of you who don’t dig podcatchers. And please share the show with someone you love. Apologies for the big gap in shows; life was getting in the way, plus I got sick somewhere in between and, while my voice would have been pure comedy on your end, it wouldn’t have been nearly as much fun on mine. No excuse though; I should have posted SOMEthing in the interim. I’ll do better next time. Six episodes ago we took a peek at the work of poet/playwright/singer/songwriter/Renaissance Man Shel Silverstein, and I guess the most notable thing related to that show that’s happened since then, is that Ray Sawyer, the singer/guitarist for Dr. Hook and the Medicine Show, died on New Year’s Eve at the age of 81 after a short illness. Sawyer was the main singer on “Sylvia’s Mother” and “Cover of Rolling Stone”, among others. So this week we’re looking at some more of his work, including what’s perhaps his most-covered song (and, oddly, a song that despite all the covers doesn’t seem to do anything on the charts; I think it’s just a song that people like to sing), and a quick look at his theater work. And please be sure to share the show with like-minded folks!